Working with a cross-functional team, I helped us create a product vision for the new Pega Discovery Network (PDN) that helped us balance short-term deliverables with a long-term strategic vision. The full project includes a full suite of UX deliverables, including flows, screens and content models for key areas of the site. My role was primarily in product vision and content strategy, helping the team align on a set of functionality and design that could be delivered in a short timeframe (the 3-4 months leading up to PegaWorld, our big user conference), while helping stakeholders brainstorm and document a longer-term vision that could be added to the backlog post-PegaWorld. The PDN is one of Pega's most active and complex websites, having grown largely organically for over a decade. The site encompasses Pega's practitioner community, documentation, tutorials and the Product Support area. It also contains software downloads, and Pega Exchange, a marketplace for extending the product. To support a key product launch at PegaWorld, we needed to take a strategic approach to making the PDN a compelling destination for Pega practitioners, and a key part of Pega's overall value proposition. Creating a Project Poster with senior leadership allowed them to align on a long-term vision while keeping sight of short-term goals. While there was a strong awareness of how important the PDN is to the sales and marketing lifecycle, the compressed timeline for a rebrand necessitated quick turnaround on the basics (articles, posts, etc.) while making space for long-term vision. 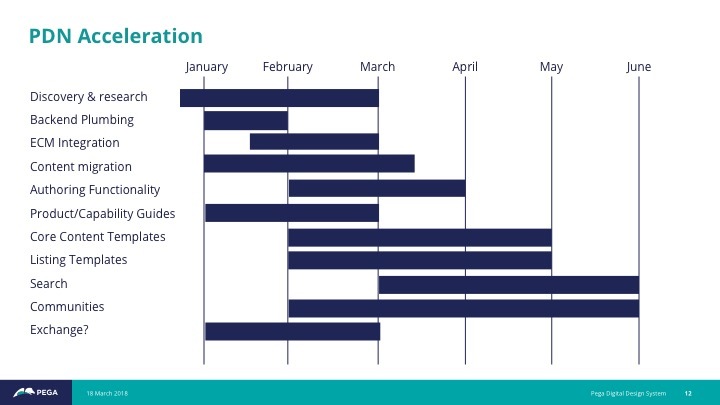 Working with the development manager and the PDN business lead, we plotted out the key sections of the site that would need a visual refresh and aligned on a scope of work that was completable within the timeline. 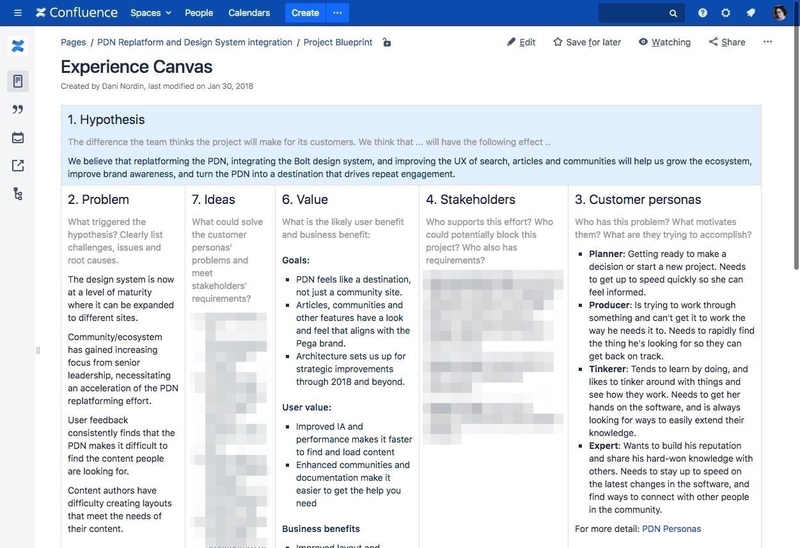 At the same time, I worked with the business lead and the UX team to do some foundational visioning and persona work to help inform the project and set us up for successful enhancements after Phase 1. By drilling into the key sections of the site and determining an approximate timeline and scope, we were able to keep the project feasible while working concurrently on a long-term roadmap. Working with executive stakeholders and my team's design lead, we created an overall Project Poster and Experience Canvas that helped us align on the overarching goals of the site, and the experience we were trying to create. 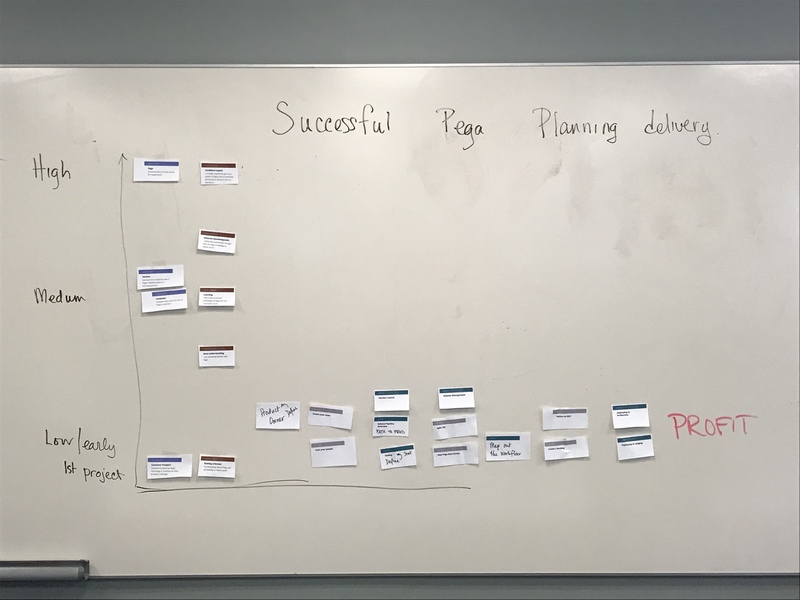 We mapped out key themes of customer intent—such as being stuck on a problem, keeping skills up to date, and starting to learn Pega—and mapped them against core activities and mindsets to produce Persona Character Sheets for the different types of people who use the PDN. A persona workshop with stakeholders allowed us to find key persona types that we later validated with survey findings. Concurrently, we took the most high-value content and functionality on the PDN (articles, documentation and communities) and gave them a visual refresh to align with the new Pega brand. 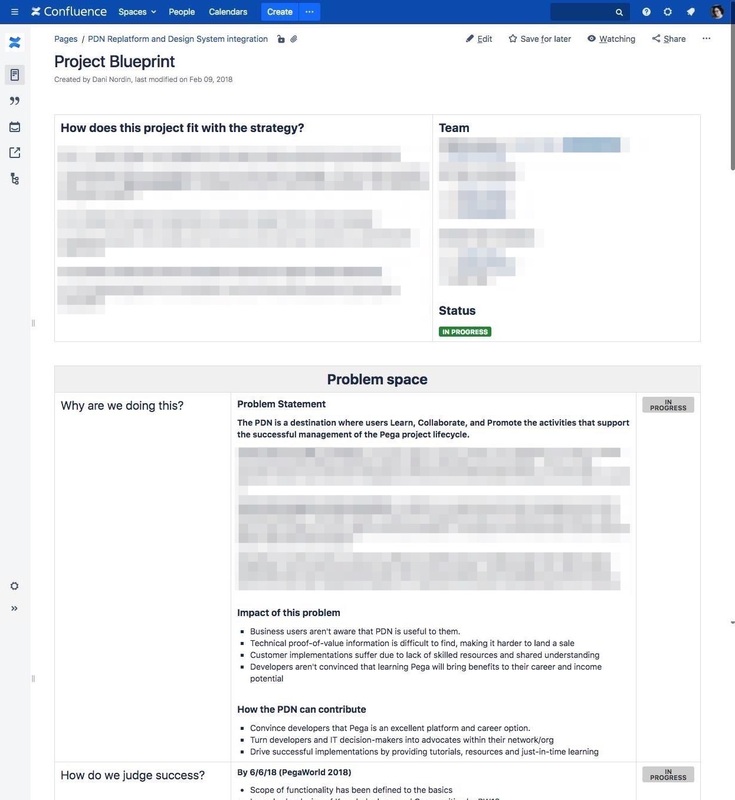 While the development team focused on migrating content to the new instance of Drupal, the UX team and I worked directly with content creators to understand the Bolt design language and components, so they could create their own overview pages for products, platform capabilities and other key Pega concepts to flesh out the site's content. Working with content owners to map out a key section of the PDN to align across customer sophistication and project phase. Facilitated Project Poster and Experience Canvas workshops to align the team on aspirational but realistic goals for the replatform. Worked with the team to run an innovative Persona Character Sheet workshop, and created an intercept survey on the PDN and Pega Academy to validate the personas. 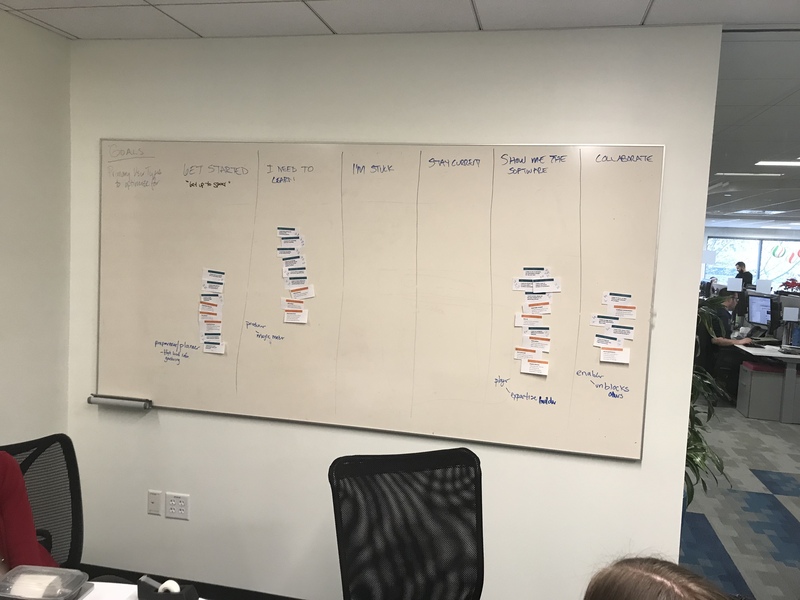 Helped a group of cross-functional content owners strategize how to best organize their content for a key section of the site by focusing on the most strategically important sliver of users, and mapping the key concepts that would help those users succeed. Worked with the business and engineering teams to break down the UX work into manageable chunks, and align the deliverables to key outcomes.